Most of the surbubs in Mutare are located along Sakubva River which cuts across the city and passes through some villages before draining into Odzi River; then it drains into Save River which passes through Marange. According to Mukokeri (1999) cited by Mapira (2011), Mutare City pollutes Sakubva River and its tributaries in three ways, 'namely by sewage, industrial and institutional waste', adding that zinc, lead, arsenic and mecury, and wastes from a pulp & paper mill being discharged from industries are polluting river water, thereby endangering human and aquatic life. It is virtually impossible to find any life in Sakubva River. The river is also polluted by detergents used by households and flushed into the sewage system which sometimes find its way into Sakubva river. There is also Municipal Sewage works at Gimboki which also dumbs sludge into Sakubva River. The effects of Sakubva River pollution are heavily felt in Dora communal lands where about 30 000 people rely on it for domestic and irrigation purposes. This community also has few alternatives to Sakubva river due to poverty and lack of awareness on the dangers of using the polluted river water. Livestock in Dora communal lands depend on Sakubva River as well. Why? Explain briefly. 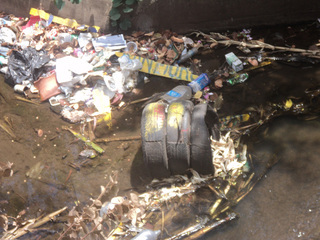 The pollution of Sakubva River and its tributaries is continuing unabated. The fines that have been charged by the Environmental Management Agency are very paltry, making it cheaper to pollute than to prevent pollution. The City Council, which must strive to keep the city, including its rivers clean, is a major culprit in pollution, hence environmental justice has not been served.